The Chronicle of Higher Education recognized the College of Mount Saint Vincent as first in the nation for two of three categories of student success and social mobility, and top top five in all three. Money magazine included the College of Mount Saint Vincent as one of the highest-ranking Best Small Colleges in the nation in 2018. College Consensus ranked the College of Mount Saint Vincent as one of the Best Regional Universities in the North for 2018. 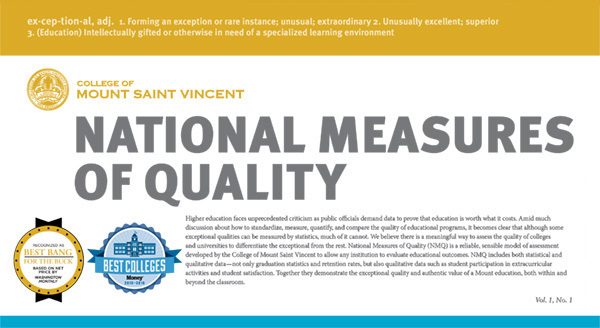 Due to its profound commitment to innovative, high impact educational practices, Mount Saint Vincent earned recognition among the nation’s 2016-2017 and 2017-2018 Colleges of Distinction. Mount Saint Vincent is frequently featured by U.S. News & World Report‘s best colleges rankings. In 2018, the College was featured in the Best Regional Universities North Rankings. Mount Saint Vincent was included among the top-performing schools in the North regional rank of the 2018 College & University Rankings by WalletHub. Mount Saint Vincent earned Field of Study Colleges of Distinction badges in Nursing, Education, and Business, reflecting its extraordinary array of exceptional programs. TFE Times ranked the College of Mount Saint Vincent as one of the nation’s best colleges. LearnHowToBecome.org (LHTB) recognized the College of Mount Saint Vincent for offering one of the richest learning environments in the state of New York. Best College Reviews named the College of Mount Saint Vincent one of the top 50 Best Small Colleges in the U.S. The New York Times highlighted a study on student economic mobility by UC Berkeley and the U.S. Department of the Treasury ranking Mount Saint Vincent third among 578 selective independent colleges and universities nationwide. Federal study celebrates College of Mount Saint Vincent as one of five colleges and universities—and the only private, independent institution—to be recognized for its mission to serve economically disadvantaged students. The Mount was recognized by Washington Monthly in the “Best Bang for the Buck” category based on net price and ranked #26 for social mobility among the best 255 liberal arts colleges nationwide. Mount Saint Vincent provides best value to students and is one of ten New York State institutions to receive an A range ranking for “value added” according to Money magazine. The Commission on Independent Colleges and Universities has identified the College of Mount Saint Vincent as a “regional leader” for STEM-educated college graduates in a report on New York independent colleges. A study funded by the National Science Foundation shows the College of Mount Saint Vincent has the highest proportion of science, technology, engineering and math (STEM) degrees awarded to Latino students of any Hispanic Serving Institution (HSI).